A typical server room is the perfect environment for Uptime Racks air conditioned server racks where floor space is at a premium. The smaller server rooms (e.g. converted coat closets) can even be less than 100 square feet. 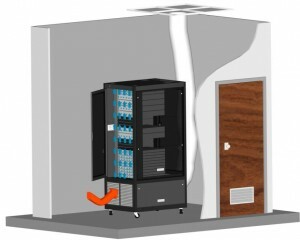 Uptime Racks’ air conditioned computer cabinets provide 13,000 Btu/hr of cooling below the open rack space, therefore the air conditioner occupies no additional valuable floor space. Small server rooms are usually tucked away in a building with no dedicated air conditioning, or uses the building’s air conditioner during the day. The MRCS13 & ECC13 will serve as the room’s primary air conditioner or supplement the building’s air conditioning during night and weekends when it is shut-off. The Uptime Racks are a cost effective way to cool down critical IT equipment.